We’d love your help. Let us know what’s wrong with this preview of May Day Murder by Jennifer David Hesse. Spring is in the air, but for Edindale, Illinois, attorney Keli Milanni, murder is the only thing blooming . . .
Keli’s looking forward to Beltane, the time-honored Wiccan holiday that celebrates life with feasting, ceremonial dancing, and ancient Celtic rituals. But since recently leaving her law firm and opening her own practice, Keli has more on her plate than simple ab Spring is in the air, but for Edindale, Illinois, attorney Keli Milanni, murder is the only thing blooming . . .
Keli’s looking forward to Beltane, the time-honored Wiccan holiday that celebrates life with feasting, ceremonial dancing, and ancient Celtic rituals. But since recently leaving her law firm and opening her own practice, Keli has more on her plate than simple abundance. Still, she always has time for a friend. Erik, a Druid from a neighboring town, has had a run of bad luck he blames on a curse cast by his ex-girlfriend Denise, a practicing witch whose expertise in the dark arts can’t save her from her own deadly end. To ask other readers questions about May Day Murder, please sign up. May Day Murder by Jennifer David Hesse was a breath of fresh air at this time of year. Ms. Hesse's characters are slowly developing now so that we get more and more insights into Keli, Wes and Farrah. I like Keli but this time she she seemed to be just a little too trusting which surprised me as she has not shown that side of herself before. Wes and Kelli's relationship seemed to be going through some growing pains in this book. Although that's a natural part of relationship growth, it still seem May Day Murder by Jennifer David Hesse was a breath of fresh air at this time of year. Ms. Hesse's characters are slowly developing now so that we get more and more insights into Keli, Wes and Farrah. I like Keli but this time she she seemed to be just a little too trusting which surprised me as she has not shown that side of herself before. Wes and Kelli's relationship seemed to be going through some growing pains in this book. Although that's a natural part of relationship growth, it still seemed that some of their conversations were a little flat and stilted. The plot is well-crafted, quickly paced with a few twists, several red herrings, very few suspects and a chilling reveal. There is also a secondary mystery thread that runs through this story that is unresolved at the end that I look forward to pursuing in the next book. I look forward to each new book in this series. I have enjoyed everyone and this is another terrific read. I've been drawn to the main character in the series since the very beginning. We have a bit in common (same birth date and profession). The story just grabbed my attention from the start and like always, I just kept reading to see how this one was going to end. I think the author has done a wonderful job with the character development. Keli is a very likable characters and continues to disc I look forward to each new book in this series. I have enjoyed everyone and this is another terrific read. I've been drawn to the main character in the series since the very beginning. We have a bit in common (same birth date and profession). The story just grabbed my attention from the start and like always, I just kept reading to see how this one was going to end. I think the author has done a wonderful job with the character development. Keli is a very likable characters and continues to discover who she is and what she wants. I like how Wes is opening up and becoming more open minded about Keli's practice of Wicca. The mystery was well done and kept me guessing. I never could pinpoint just who I thought was responsible. Spring is in air and Edindale, Illinois attorney, Keli Milanni is feeling great as she is looking forward to the Beltrane, a long-standing Wiccan holiday in the fifth book of the Wiccan Wheel mysteries. She has left the law firm and open her long office. She meets Erick, a Druid and offered him a ride as he was stranded. Arriving at his destination they find his ex-girlfriend, Denise dead. Strange events are happening and Keli finds herself a person of interest. I found the description of Keli's Spring is in air and Edindale, Illinois attorney, Keli Milanni is feeling great as she is looking forward to the Beltrane, a long-standing Wiccan holiday in the fifth book of the Wiccan Wheel mysteries. She has left the law firm and open her long office. She meets Erick, a Druid and offered him a ride as he was stranded. Arriving at his destination they find his ex-girlfriend, Denise dead. Strange events are happening and Keli finds herself a person of interest. I found the description of Keli's life intriguing. The spells describe were enlightening about how a Wiccan lived. Keli needs an answer to what is happening to her life as things begin to go wrong for her. Will she find it before she joins Denise in death? I HIGHLY RECOMMEND THIS BOOK AND SERIES. A Cozy Book - Keli’s looking forward to Beltane, the time-honored Wiccan holiday that celebrates life with feasting, ceremonial dancing, and ancient Celtic rituals. But since recently leaving her law firm and opening her own practice, Keli has more on her plate than simple abundance. Still, she always has time for a friend. Erik, a Druid from a neighboring town, has had a run of bad luck he blames on a curse cast by his ex-girlfriend Denise, a practicing witch whose expertise in the dark arts ca A Cozy Book - Keli’s looking forward to Beltane, the time-honored Wiccan holiday that celebrates life with feasting, ceremonial dancing, and ancient Celtic rituals. But since recently leaving her law firm and opening her own practice, Keli has more on her plate than simple abundance. Still, she always has time for a friend. Erik, a Druid from a neighboring town, has had a run of bad luck he blames on a curse cast by his ex-girlfriend Denise, a practicing witch whose expertise in the dark arts can’t save her from her own deadly end. When Keli finds herself a person of interest in the investigation, she begins to wonder if she herself might be cursed. With a little help from her friends, including her devoted boyfriend Wes, Keli aims to find out who poisoned Denise. What she uncovers is a witch’s brew of spells, hexes, and black magic that raises questions about her own Wiccan worldview. As the community gathers for the May Day festivities, it’s up to Keli to stop a killer from springing ahead to another murder. May Day Murder a cozy book by Jennifer David Hesse from Kensington Books comes a new addition to the “A Wiccan Wheel Mystery” series. Which also happens to be one of the best cozy series on the market today. Readers flock to the bookstore to get the latest addition. Fueled by the wiccan movement across the globe, Ms. Hesse demonstrates her grasp of what people want. Not only in a cozy mystery but in their lives. Keli Milanni is a superior character who has been created to be likable with human flaws. She is at times far too trusting of her fellow man. Fearful of what will happen when her friends and peers find out that she is a practicing wiccan. She is private with her beliefs and her lifestyle tries desperately to keep her life out of the public eye yet keeps getting thrust into the limelight where time and time again, her spiritual side is being revealed to those around her. She is torn between what she knows is right and what she wants to do with little space between the two to distinguish between them. Other characters such as Keli’s live-in boyfriend, Wes, and her friends such as Farrah are developing into wonderfully diverse characters that help with investigations and keeping Keli on the straight path. They are learning to appreciate as well as respect her beliefs and choices without sacrificing their own. In May Day Murder, Keli has finally come to the point where she must make a decision to keep her career separate from her beliefs or give up the hard work of keeping them separate and much of the real her hidden form those she sees and deals with daily. Her conflicting emotions get her caught up in another murder. Her decision is taken out of her hands when the killer zero’s in on her as she tries to help keep herself out of prison. Discovering the murder of a complete stranger has the police looking at her as the top and possibly only suspect. All because she was in the wrong place at the wrong time. In the end she has to take stock of her desire to keep her life private or unmask a killer before she becomes the next victim. In the end the killer is caught but not without problems. The identity of the murder and the motive is a bit of a surprise and will leave readers happy and satisfied. Thank you to NetGalley for the opportunity to read this book. A wonderful installment in the Wiccan Wheel mysteries. The whodunit kept me guessing. I enjoy these characters (would love to see some more excitement between Keli and Wes though 😉). I am definitely looking forward to Autumn Alibi. The mystery is fast paced and has a good flow. This book had more Wiccan / pagan tradition in it than Samhain Secrets did and I found some of it difficult to follow since I know so little about those practices. But I enjoyed the story – Keli is a fun and feisty protagonist with loads of charm. This is the 5th book in this wonderful favorite series. I have read and recommend the entire series for your reading enjoyment. The writing is well crafted, the sleuth is always challenging and the charcters are likable and add to each book. This was a ARC from Net Galley. Thank you to the publisher and Net Galley. My opinions are my own. In this next in series our protagonist Keli Milanni is continuing her studies as a practicing wiccan. Her spiritual practice is slowly being revealed to those This is the 5th book in this wonderful favorite series. I have read and recommend the entire series for your reading enjoyment. The writing is well crafted, the sleuth is always challenging and the charcters are likable and add to each book. This was a ARC from Net Galley. Thank you to the publisher and Net Galley. My opinions are my own. In this next in series our protagonist Keli Milanni is continuing her studies as a practicing wiccan. Her spiritual practice is slowly being revealed to those close to her. She is running her own law practice now and finding it challenging to keep her Wicca practice separate from her work. The paranormal aspect is very fun to read about and interesting. Its no wonder this series is so popular as the author weaves magic perfectly into her charcter and each plot. I love learning about the practice of Wicca in each book. Up until now she has hid her practice as a witch and is moving toward reveling it . This is her focus and inner struggle with this next in series. Her boyfriend Wes now lives with her and is supportive and her good friend Farrah is very close to her and helps her with her sleuthing. When she finds the body of a stranger the police immediatly looking at her as the only suspect. As she scrambles to prove her own innocence, hold onto her business and use her Wicca practices to help her she is pulled in many directions one which puts her in danger . She calls on a friend that is a Druid and others within her Wicca coven to help her prove her innocence by finding the right suspect. I received an ARC of this book from Netgalley in return for an honest review. Keli is an attorney building her own practice, she’s also a semi closeted Wiccan. When an ill-fated favour for a friend lands her not only in the middle of a murder investigation, but also a person of interest in the investigation, Keli attempts to clear her name, find the real killer, and save her reputation. Whilst also struggling with her now public identity as a practising Wiccan. I loved this book!! It was a nice qu I received an ARC of this book from Netgalley in return for an honest review. I loved this book!! It was a nice quick read, no complicated texts, although some things, I felt, were a little bit over explained. Saying that it was a good engaging story, the characters were well developed, and I love it when I feel I’ve learnt something from a book too. As there was also a nice touch where Hesse gives a few little insights into the life of a practicing Wiccans. As a pagan myself, it was actually quite a joy to read these aspects openly described in the book. I hope that this could also help any non-esoteric types gain a better insight into what Wicca is really all about. This is the fifth book in a series. I haven’t actually read any of the other books in the series, so was a little worried that there would be a lot of references that wouldn’t make sense, or characters with pre-existing back story. Surprisingly had a good standalone storyline, I thoroughly enjoyed it without needing any prior knowledge of the series. All the characters were well introduced and any references to past events were relevant to the story and had a brief explanation with it. 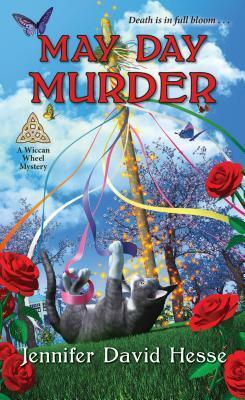 May Day Murder is probably the best book in the Wiccan Wheel mystery series so far. Not only is there a murder mystery, but there's also another mystery going on with Keli at her new law office. I don't like posting spoilers in my reviews, so that's all I'll say about that. I'll admit that I was actually surprised by who the killer ended up being. But I like how the author crafted the mystery to where, once you do find out who it is, it makes perfect sense and you wonder how you missed it the wh May Day Murder is probably the best book in the Wiccan Wheel mystery series so far. Not only is there a murder mystery, but there's also another mystery going on with Keli at her new law office. I don't like posting spoilers in my reviews, so that's all I'll say about that. I'll admit that I was actually surprised by who the killer ended up being. But I like how the author crafted the mystery to where, once you do find out who it is, it makes perfect sense and you wonder how you missed it the whole time. I am also glad that Keli is starting to loosen up about people knowing she's a witch. She's not as open as, say, Mila, but she's definitely making progress. I can't wait for the next book in the series to see how the new mystery in Keli's life plays out. Book 5 in the series. This book was ok. I like the characters, I like that Keli has her own law practice now. The story was interesting and quick moving. But I felt like Keli acted a bit out of character with Erik. My biggest complaint about this book was the secondary mystery that was slyly slipped in and left unsolved at the end. I feel like that's the new version of a cliffhanger, done to make sure the reader comes back to read the next book and it really annoys me. As a result, I dinged it a Book 5 in the series. My biggest complaint about this book was the secondary mystery that was slyly slipped in and left unsolved at the end. I feel like that's the new version of a cliffhanger, done to make sure the reader comes back to read the next book and it really annoys me. As a result, I dinged it a full star. I am curious about how things will end, but not enough to overcome my annoyance. Spring is ushering in a multitude of changes in Keli's life. Now operating her own legal practice, and finally coming into her own as a practicing Wiccan, Keli is ready to just enjoy the changes in her life, Her relationship with her wonderful boyfriend Wes is going well, they even live together! And although business is slow, Keli is really enjoying working independently. All of that changes when she is introduced to Erick and unknowingly becomes a suspect in a murder case when his ex-girlfriend Denise is found dead. This story is definitely a unique twist in cozies. The protagonist, Keli Milanni, is a wiccan lawyer that finds herself involved with "witchy people" in trying to solve a murder entangled with hexes and curses. However, she soon finds herself a victim of harassment or maybe even a curse or two. This is an intriguing and sometimes suspenseful story. It moves along at a good pace giving readers lots of information but yet keeps the murderer unknown until the end. Thanks to Kensington books and NetGa This story is definitely a unique twist in cozies. The protagonist, Keli Milanni, is a wiccan lawyer that finds herself involved with "witchy people" in trying to solve a murder entangled with hexes and curses. However, she soon finds herself a victim of harassment or maybe even a curse or two. Keli has opened her new solo law practice. And no surprise it’s a bit of a struggle. However, the problems aren’t quite what she expected. Keli finds herself involved in a murder meeting Erik. Somehow everything seems to point to Keli and she has no idea why. In addition, everyone starts to identify her as a witch. Erik always seems to be in the picture, but why? I enjoyed this book. It is the first Wiccan Wheel Mystery for me but I’m sure it won’t be the last. I'm a fan of this series so by now I know what to expect. I liked the story although I felt the ending was a little too far fetched. I won't give away any spoilers. I did like that she set up some previews of continuing story lines. I gotta be honest though, I'm tired of Wes. I would love to see Keli end up with Crenshaw. I just think they would challenge each other and make a much better team. May Day should be one of the most joyous holidays of the Wiccan calendar, but NOT when you kick off the season with a dead body! Keli finds herself right in the middle of a murder, one of the prime suspects, and possibly on the wrong end of a curse! With the every-faithful and heroically understanding Wes in tow, she sets out to find whodunit, and to right some very, very wrongs! I really enjoy the premise of this series and look forward to reading the Wiccan rituals interspersed with the mystery. However I found this latest whodunit fell a bit flat. This will not stop me from reading the next book in the series. I thought it was a first book in the series,I tried reading a few chapters just felt like I was missing something.It wasn't necessary bad book I just couldn't connect with any characters in it.I will have to come back at a later date. I had read the previous book in this series on NetGalley, so when I saw this I was keen to see what happened next. What was particularly interesting about this one was how it had two mysteries, one that was solved and one that was ongoing. But the author makes the clues so subtle, the ongoing mystery provides red herrings for the mystery that is solved. In terms of character development, it was nice to see Keli settling into her own law practice and amusing to see her being identified as the witch I had read the previous book in this series on NetGalley, so when I saw this I was keen to see what happened next. In terms of character development, it was nice to see Keli settling into her own law practice and amusing to see her being identified as the witch lawyer when she'd worked so hard to keep that part of herself private. Jennifer David Hesse is the author of the Wiccan Wheel Mysteries , a cozy mystery series published by Kensington Books. Born and raised in Central Illinois, Jennifer earned her undergraduate degree as an English major from Eastern Illinois University and her law degree from the University of Missouri-Columbia. After an eight-year stint in New York, she now makes her home in Chicago with her husband Jennifer David Hesse is the author of the Wiccan Wheel Mysteries , a cozy mystery series published by Kensington Books.